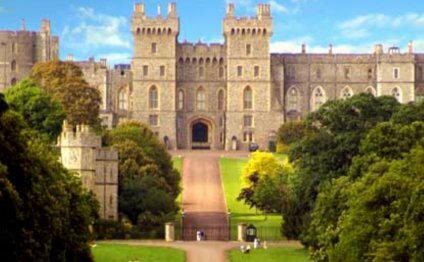 The Castle of Windsor was first built by William the Conqueror, soon after his being seated on the throne of this kingdom, on account of its healthful and pleasant situation, and probably by less as a place of security and strength, in the beginning of his reign: His son, King Henry I greatly improved it with many buildings, and surrounded the whole, for its greater strength and beauty, with a strong wall. Succeeding monarchs also, for the same reason, constantly resided here. The artist's impression above illustrates how the castle might have looked in its earliest days, constructed on a chalk mound on a bend of the river amidst a barely populated landscape. No claims of historical accuracy are made for this painting (by Michael Vickery). In this castle, Henry II held a parliament, in the year 1170; and here King John lodged, during the content between him and the barons. However, in the disputes between his son and successor, King Henry III, and his barons, this castle was, in 1263, delivered by treaty to them; but in the same year, it was taken by surprise and made the rendezvous of the King's party. King Edward I and Edward II resided at Windsor, more on account of its delightful situation than its strength; and had many children born here, among whom was the heroic Edward III, who had an extraordinary affection for this, his native place; and in the year 1360 caused the old castle to be entirely taken down, except the three towers at the west end of the lower ward, and rebuilding the present stately castle, made it the seat of the Most Noble Order of the Garter. In succeeding times, other additions were made to this noble place. King Henry VII added the stately fabric ad joining to the King's lodgings, in the upper ward. Henry VIII rebuilt the great gate in the lower ward, leading to the town. King Edward IV began, and Queen Mary perfected, the bringing of water from Black Moor Park, in the parish of Winkfield, into a fountain of curious workmanship, in the middle of the upper court. Queen Elizabeth made a terrace-walk, on the North side of the Castle, from whence is a delightful prospect of the Thames, Eton College and a great number of fine seats, dispersed over the adjacent country. Under Charles II this castle, which had felt the effects of the national convulsions, under several avaricious and lawless masters, was entirely repaired. The face of the upper court was changed, and brought to its present beauty. The windows were enlarged, and made regular; and the royal apartments were completely furnished, and adorned with beautiful paintings. This prince also not only enlarged the terrace walk, made by Queen Elizabeth, on the North side of the Castle, but carried a like terrace round the East and South sides of the upper court and new faced the whole terrace with a noble rampart of free stone. This terrace extends 1, 670 feet in length, and may with justice be said to be the noblest walk in Europe. Several additions were made to this castle, by some of our early princes, and lastly by Queen Anne. Footnote: The repairs and embellishments made by his present Majesty, which are numerous and splendid, are passed over in this general view, as they will more properly be noticed in their respective places. But as these have been obliterated by time, and succeeding alterations, a minute detail of them would exceed the limits of this epitome. I shall therefore briefly inform the reader, that this castle is divided into two courts, or wards, with a large keep, or round tower, between them, called the middle ward, and then proceed to give a description of the several parts of it, in its present state; but first, that he may conceive some idea of this most delightful situation, I shall present him with the following quotation, from Sir John Denham's Poem of Cooper's Hill. Sir Hugh Ashley Roberts, GCVO, FSA, is an art historian and curator.